When is a protest good, just, progressive, and defensible? One might think there was a single answer to this question based on an objective set of metrics. But in reality, according to the West, protests are only good so long as they serve their interests. Images: The three-fingered salute of the neo-Nazi Svoboda party can be seen in the pro-EU protest above right (photo via CNN). The actual constitution of the mobs are never mentioned in the Western media because it would lead curious readers to sites like, "Unity of Nobility - De-Kosherized News & Research Material" which feature Svoboda in articles like, "Ukrainian Nationalist have the Jewish rats shrieking." Some 10,000 demonstrators against the Ukraine's decision to not sign a landmark trade deal with the European Union descended on a square outside a monastery early Saturday in response to a police crackdown on the earlier protests. The emboldened demonstrators waved Ukrainian and EU flags and sang the national anthem outside the St. Michael's Golden-Domed Monastery, where groups of protesters retreated earlier after a sweep by riot police left seven people hospitalized and dozens under arrest at Independence Square. Three top opposition leaders called for resignation of President Viktor Yanukovych as well as new presidential and parliamentary elections, according to a statement released by Vitaliy Klitchko, Arseniy Yatsenyuk and Oleg Tyagnybok. ...riot police stepped in early Saturday and "brutally dispersed" several hundred people who were demonstrating peacefully in support of Ukraine's European integration, according to a statement from Poland's Ministry of Foreign Affairs. "Forceful dispersion of peaceful demonstrations does not help the cause of Ukraine's integration with Europe," ministry spokesman Marcin Wojciechowski said. 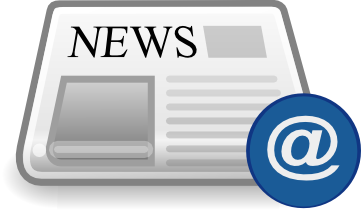 "We caution Ukrainian authorities against using force as it may carry unpredictable and irrevocable consequences." The United States condemned what it called "violence against protesters" in a statement posted online by the U.S. Embassy in Kiev. A statement released Saturday by the U.S. State Department said, "We urge Ukraine's leaders to respect their people's right to freedom of expression and assembly ... We call on the Government of Ukraine to foster a positive environment for civil society and to protect the rights of all Ukrainians to express their views on their country's future in a constructive and peaceful manner in [Kiev] and in other parts of the country. Violence and intimidation should have no place in today's Ukraine." 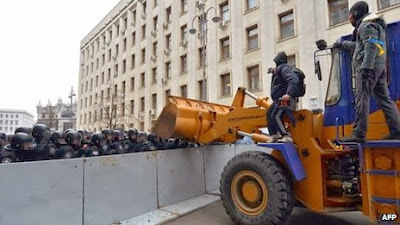 Ukrainian protesters have used fire and even bulldozers in an attempt to break police barricades, as reported by both the UK Independent and the BBC. Images: Scenes from the pro-EU protests in Ukraine. Protesters have used fire, clubs, and even bulldozers to break through police barricades. 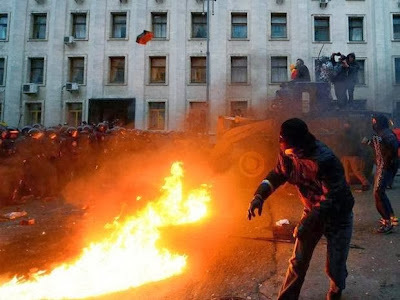 The West has backed the protests and condemned Ukraine's police for "violence and intimidation" for employing riot gear and tactics regularly used even in cities across the US and UK. Of course, it should be obvious why the US, UK, and EU, and the Fortune 500 interests that direct the governments of each, are behind the protesters, literally funding most of their activity. The European Union is simply the collectivizing of Europe, the reduction of protectionism that impedes powerful multinationals, and offers corporate-funded policy makers the ability to create one program to apply to all nations at once. Convenient, one-stop corporate-fascism. Violence and the seizure of public or private property are not acceptable means of resolving political differences. Additional hypocrisy can be read in the Guardian, another "reputable" Western news source, which takes a similar protest, this time in Thailand, and paints it out as violent, undemocratic rabble. The protests' target? 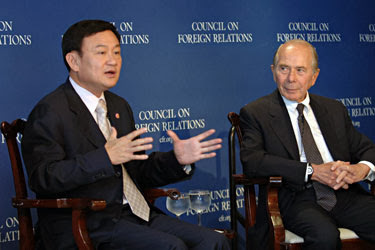 The regime of Wall Street-backed Thaksin Shinawatra and his nepotist appointed proxy, prime minister Yingluck Shinawatra. The Guardian intentionally omits at least 3 other confirmed deaths, all students, and all killed and confirmed BEFORE the "government supporter's" death was reported, in an attempt to portray the protesters as being a murderous mob. Images: Top - a regime gunman fires at students in clashes that have left at least one student confirmed dead. 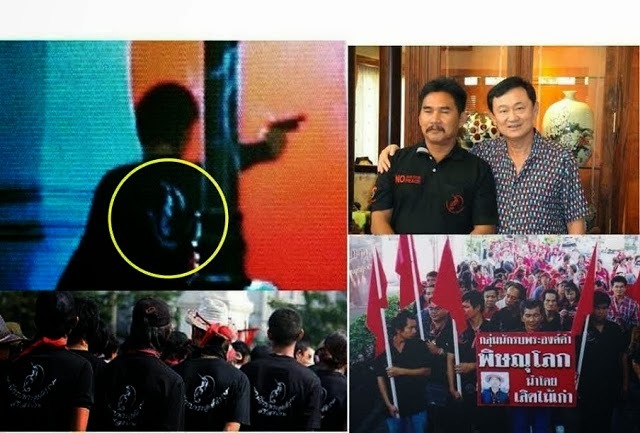 Middle & Bottom - His t-shirt is identical to those worn by a sect of pro-regime "red shirts" hailing from Phitsanulok province, part of Thaksin Shinawatra's northeast political stronghold. This particular sect has close ties to regime MP Jatuporn Prompan, and was involved directly with bloodshed in 2010's violence as well. One image features a member posing with Thaksin Shinawatra himself.The group was trained by the now deceased Khattiya Sawasdipol, better known as "Seh Daeng," who was shot dead at the height of the 2010 armed insurrection he was leading in the streets of Bangkok on behalf of Thaksin Shinawatra. 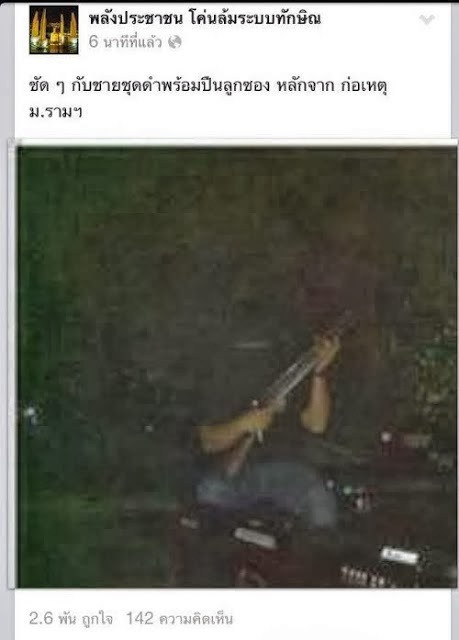 The groups is now pictured in the below article next to an image of a gunman involved in last night's violence. Image: Photograph of another gunman so far responsible for the death of at least one student and many more injuries. 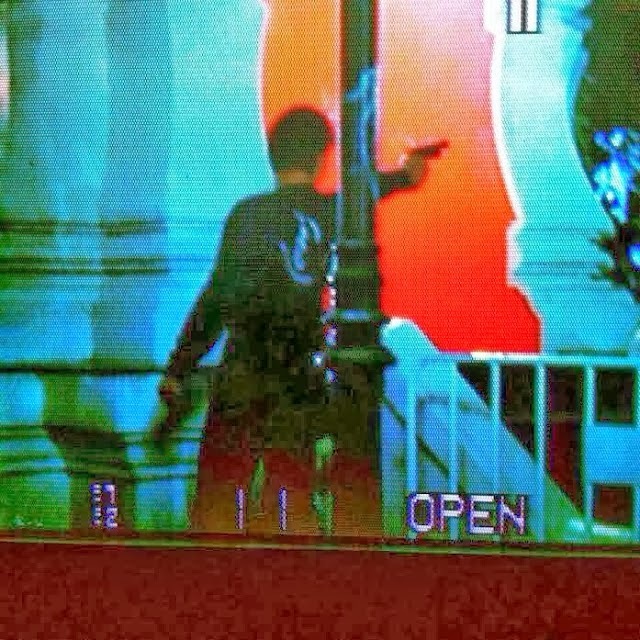 The gunmen are clad in black, carrying a variety of weapons. There have been reports of both shooters operating in the streets and from rooftops. None of this is mentioned in the Western press. The violence actually took place on the other side of Bangkok, away from ongoing anti-regime protests, where the regime was holding its own "counter-rally." Thousands of students from a nearby university began protesting the disruptive, 24 hour a day, week long rally. After warning the students to disperse, regime leaders unleashed black-clad militants who were captured on video and in photographs firing on students. For hours, the students had been surrounded and continuously shot at - clashes continued as encircled students attempted to break out and escape. It was in these clashes, not the protests, that the deaths occurred - a fact no unsuspecting reader would know if they depended on the Guardian for their daily news. And while the Western press calls the Ukrainian riot measures "violent," no mention of similar "violent crackdowns" can be seen in the Western media regarding the Thai protests despite the regime using both Ukraine's methods of crowd control as well as armed militants who have already claimed several lives. Why is the West Defending the Thai Regime? The regime of Thaksin Shinawatra and his sister, Yingluck Shinawatra, have been backed by the West for nearly a decade, and brother Thaksin even before first taking office in 2001. It is clear that the West has invested astronomical amounts of time and resources into the Shinwatra regime, and its condemnation of anti-regime protesters constitutes the West attempting to protect their investments, not any ideal of "rule of law" or "democracy." 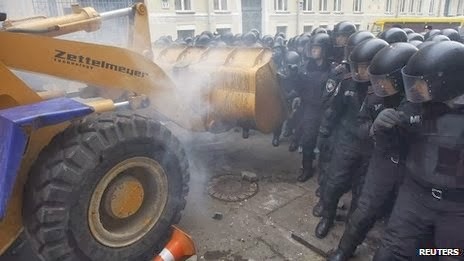 The pro-EU protests in Ukraine have used bulldozers to break through police barricades. This has not been condemned by the West, and as long as Thai protesters ensure to protect the lives of by-standers and police, similar measures must surely be seen as "acceptable" international "norms." For Thai protesters, however, it is unlikely that they would benefit from or even desire driving a bulldozer at fellow countrymen, and could instead use large vehicles to breach walls where police cannot defend, in order to gain access to government buildings. Fire also seems to be an acceptable means of protest. Called "peaceful" by the United States and other pro-EU governments, in both Ukraine and in previous, pro-regime rallies in Thailand, fire can be used (and should only be used) to create defensive barriers to limit the forward movement of police. It should be placed far ahead of police to force them to make lengthy preparations to breach such barriers. In this time, protesters can than move to better strategic positions to achieve their objectives. And while protests in the Ukraine supported by the "international community" may give Thais several cues on what to do, they also give Thais the opportunity to show that they are better. 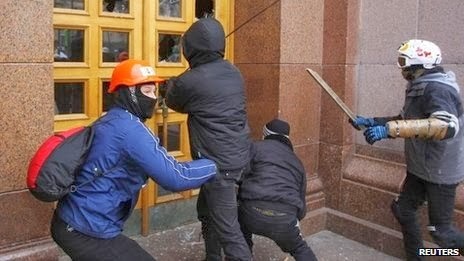 While the Ukraine protesters represent hooligans, racists, bigots, and literally entire parties promoting neo-Nazism such as Svoboda mentioned in this BBC article (Nazi background here), who cannot be guaranteed to not eventually resort to escalating levels of violence, the Thai protesters must remain peaceful. Police that are overwhelmed should be treated with dignity and reminded that they are fellow countrymen and not the true targets of the protesters nor their goal - but rather the goal of us all - the removal of corporate-financier interests dictated from afar. 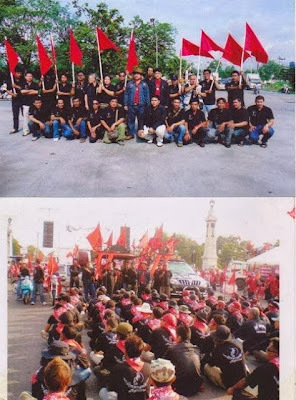 Land Destroyer Report, Alternative Thai News Network and LocalOrg.